Truffles are one of the world’s most loved ingredients. People are willing to spend tens of thousands of dollars to purchase big ones and chefs go crazy for them. As much as people adore the flavour of truffle not many people actually know that much about them. 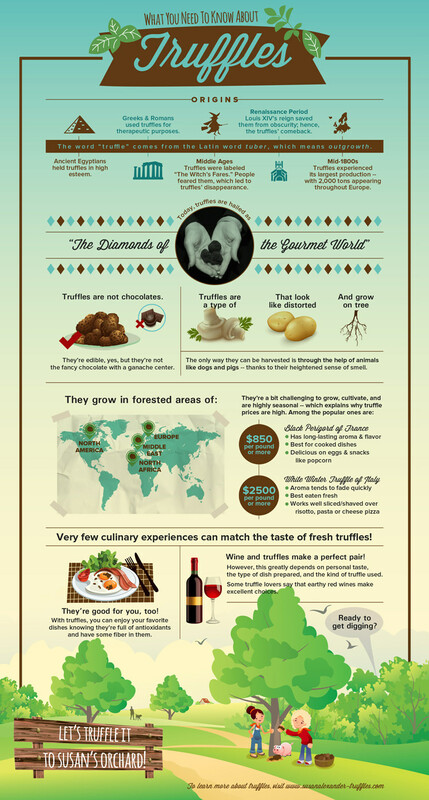 This infographic from Susan Alexander Truffles offers up a detailed breakdown of truffles, from their origins that date back as far as Egyptian times to how they became one of the world’s most sought after delicacies. There’s also some info on where in the world truffles come from, how they grow and what type of wine to look for when eating truffle. We also have a guide for what to look for when buying truffle. Thats a great infographic! Susan is great in the northern hemisphere, but if you are looking for truffles from Australia and other parts of the world, have a look at The Truffle Queen https://www.thetrufflequeen.com She has incredible local knowledge and works closely with the best trufieres in Australia and around the world.